As I told readers of my Full Moon post, two weeks ago, I am engaged in several different projects right now*, so for the time being, rather than write a lot of new material in my posts, I'm going to offer you little tidbits from my archives. This one is from a Full Moon post a year ago. A strange but true story and the benefits of Pronoia. My next morsel is from the book Transitions :Making Sense of Life's Changes by William Bridges. This has been an influential book for me that I cannot recommend highly enough to anyone going through a major life transition. It has been enormously popular for decades with readers from all walks of life. In the epilogue, Bridges (gotta love how appropriate his name is!) tells the story of the goddess Psyche. 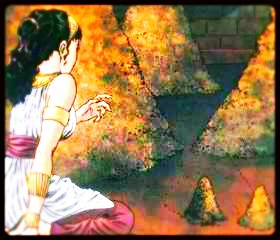 After making a bad decision, Psyche was given the chance to redeem herself by completing four difficult tasks. For the first one she was put into a room with an enormous pile of mixed up seeds and told she must sort them by morning. Eventually, overwhelmed by the impossibility of the task, she gave up in despair and dropped into an exhausted sleep. As she slept, the room swarmed with ants who sorted all of the seeds for her. When I first decided to create Sparks & Leaps over five years ago, I felt much like Psyche. I had more thoughts bouncing in my brain than a field of leaping locusts on a hot summer day and my piles of paper rivaled Psyche's pile of seeds. I did my best to pin down some of the random concepts on paper and organize them along with the chaotic piles of scribbled scraps, the grocery bags filled with stacks of clipped file cards and a rainbow of tiny sticky notes on tag board. Like Psyche, I eventually gave up in overwhelming despair and exhaustion. 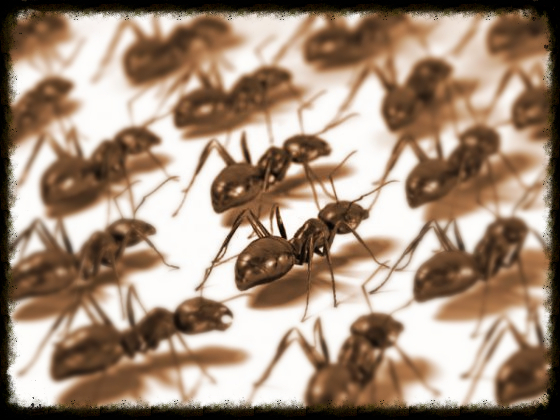 Since I had recently reread her story, I thought of wistfully of her "assist-ANTS” and on a whim, I wrote the word "ants" on a little blue sticky note and announced to the Universe that I could use some kind of assistance as well. Then I went to sleep. In the morning, (I swear I am not making this up!) The wall of my kitchen above the counter was covered with ANTS! I had never before that time seen a single ant in my apartment and I freaked out. My first horrified thoughts were of how to annihilate them without toxic poisons or squishing them all over the white wall. And then I remembered the blue sticky note. It seemed unfair to kill them when I had asked for them, so I started to scoop them up on file cards (God knows I had plenty of those around!) and deposit them outside - much like my previous adventure with the bees. Feeling ridiculous, I thanked them for their helpful intentions but explained that it was meant to be a METAPHOR! 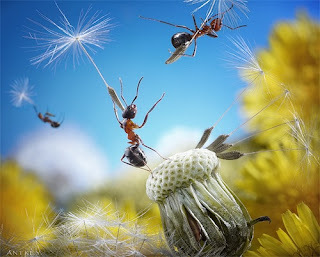 Although the ants did not magically sort out my piles of paper or endless seeds of ideas, they helped reinforce my faith that "cooperators are standing by". As a result, my task felt much lighter and more manageable. As I shifted out of overwhelm, I was able to think more clearly and to make some progress. Synchronicities like this one have been happening with the ever increasing frequency in my life and I simply don't believe they are coincidences. It is certainly possible that this is the case, but when I live my life believing Pronoia -the opposite of paranoia (Rob Brezsney's book based on the theory that "the whole world is conspiring to shower your life with blessings"), I am MUCH happier and consequently am kinder to myself and others. I'm also more willing to take healthy risks - not jumping off cliffs, but dancing on the metaphorical edges of life. And I have more energy, enthusiasm and confidence. If I am delusional, I just don't see the downside! I'm not saying we should all be perpetual grasshoppers (as in the tale of the Ant and the Grasshopper)- we do need to put food on the table. But when we honor those times between our old and new lives with some kind of ritual, and/or allow for moments of quiet contemplation or "frivolous" play, especially in the midst of challenges, we create a gap that allows other ways of seeing to emerge. When we are trying to sort out the chaos of major life changes or even just survive during this time of enormous planetary changes, sometimes the most productive thing to do is to be "unproductive" . *One of the projects I am currently engaged in is one my "inner ant" is happy about. 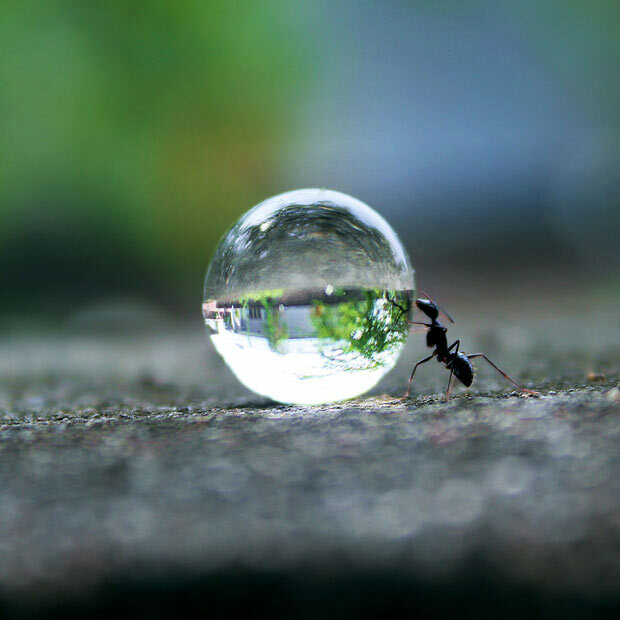 I am now offering my services as a Crisis Assist- ANT to anyone in Marin who needs temporary support and/or help with practical tasks during a crisis. I am still writing my book and redesigning Sparks & Leaps, but I decided to offer this service part time while I am completing those projects. If you know of anyone in Marin who could benefit from my help, please send them the following: THANK YOU! supporting you with determining your next steps. Please contact me at michelle@sparksandleaps.com if you would more information. And in the mean time : BREATHE!